ET Intelligence Group: Managers of the fattest purses in London, New York or Tokyo have always stuck to a simple investment theme when in Mumbai: Safety first, glory if possible. So, money from the global financial hubs has chased Indian stocks only in periods when valuations here were reasonable. This March — the last before this summer’s nationwide balloting — has been a striking exception to that rule. In the last month of FY19, overseas investors net invested $4.2 billion (Rs 33.980 crore) into local equities in a 24-month record on inflows, according to Bloomberg data. And the flows have coincided with valuations that would be considered much higher than the average. The Nifty is trading at 26.13 times the trailing earnings — the highest since 2000 and more than one standard deviation from the mean. The cumulative rolling 12-month investments are just a few million dollars away from turning positive because of the recent rush. On an average, foreign portfolio investors (FPI) have invested $522 million (?3,600 crore) monthly in the past five years. In the past ten years, FPIs have invested $122 billion into Indian equities—equivalent to the market capitalisation of Reliance Industries. About 92 per cent of this cash mountain had come in when Nifty 50 valuations were below historical averages. Total Indian equity assets under the management of FPIs stood at $413 billion, equivalent to about a fifth of the country’s market capitalisation. 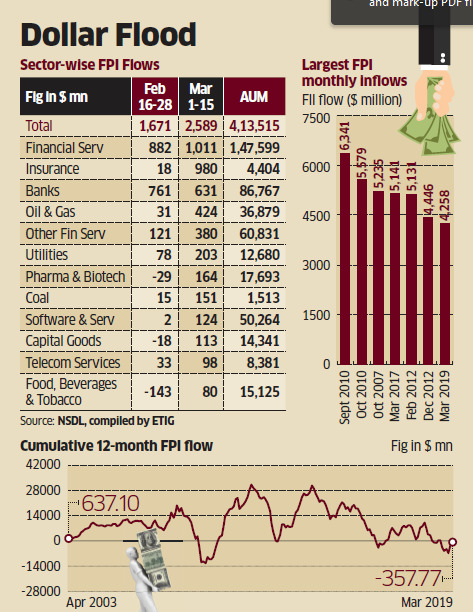 There are two probable reasons FPIs are raising their bets on Mumbai. First, global central banks from Tokyo to Toronto are again turning dovish, and traders are pricing in an interest rate cut by the developed market central banks, something that would please emerging markets. Over the past four years, the overweight position of global funds on India has dropped 400-450 basis points, giving comfort to foreign investors. 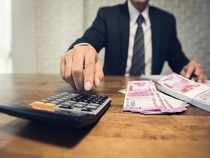 Second, the consensus projected earnings growths for 2019 and 2020 for India are 21 per cent and 19 per cent, respectively, the highest in the Asia Pacific region. Traditionally, growth markets such as India tend to outperform significantly after any inversion in the US yield curve. And on March 22, the US yield curve showed the first signs of inversion since the global financial crisis.